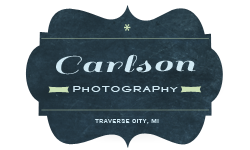 Carlson Photography - Traverse City, Northern Michigan Wedding and Family, Senior or Infant Portrait Photographer - Why hire a professional photographer? At a recent Bridal Show I heard more than once from a bride walking by something like this, "I've got this friend who has a nice camera and he is going to take pictures for free." I understand the difficulty of budgets and the need to try to save money but I'm hoping to convince you that photography isn't the area to do it in. So why hire a professional photographer? If you needed surgery and someone gave me the very best, the sharpest of scalpels, would you trust me to operate on you? An obviously extreme example but the principle is the same. The person behind the camera is more important than the camera itself. A professional photographer is an artist, event planner, networker, counselor and more. How about social skills? A professional knows how deal with all sorts of people. Large groups and small groups. What about the guest that drinks a little too much? How about the person in your bridal party that is scared to be seen or the one that wants everyone to see them all the time? In the end skill is even more important than the gear! You also need to realize that photographing a wedding is different than taking a picture of the family outing to the beach. A professional is always on his toes. Ready to adjust and be ready to capture all those important moments. He'll start with shooting everyone getting ready then right into the ceremony making sure to catch all the important moments without being a distraction while also being creative and artistic. Then you have all the details like rings and shoes and decorations. Then you are dealing with all the family, grouping everyone together quickly so you'll have time to get some great pics of the special couple. Then you are off to the reception where you'll encounter an array of lighting situations that "auto" mode on your camera just isn't capable of handling. In the end, your photographer, the one behind the lens, makes all the difference. The literal understanding of the word photography is "drawing with light." If you don't understand how to use natural light or artificial light (flashes) you can't take good photographs. How do you diffuse light, use shadows, deal with a dark reception hall or mid-day sun? If your photographer just puts on his flash and points it right at you, you'll end up with a photo that looks like everybody else's even though they are using a point and shoot. The only difference is that it has more mega pixels so you can blow it up really big...but I wouldn't. A professional photographer spends their time constantly learning and being inspired to be the artist you need them to be. They are aware of new equipment and new techniques. They know the venues and will scope them out if they haven't been there before. What about after the wedding? In a 9 hour wedding, a good photographer will have 1000s images. A professional with meticulously comb through them getting rid of the duds and editing and tweaking the rest to make sure that they are all the best images they can be. A professional won't go home, unload the images from their camera, burn them to a disc and send them your way. They have the time that your friends simply doesn't have to create memories for you that will last a life time. Many of us deal with a reality where we have to find ways to save money. But of all the things that you'll spend money on, most of it will be used, eaten or thrown away. The tux will be returned and the dress put in storage. The images that tell the story of your day will last a lifetime! I also realize that every professional photographer had to start somewhere. If you have a friend who is interested in photography, ask your photographer if they can take pictures as well. Tell your friend to watch and learn and if there is time, to ask questions. I think most professional photographers would be fine with that.